When I was a teenager, my dad would take me to bridge tournaments in Charleston and teach me how to predict the moves of others in the room. This was duplicate bridge, where every table plays the same hand. Winning is about communication, focus, taking calculated risks, being aware of what’s going on around you, and understanding what your competitors are doing. It’s not all that different from winning in business. My dad showed me how the easiest people to beat weren’t necessarily the new amateurs who’d make unpredictable plays, but the really smart engineers who thought they’d win by making the right mathematical and traditional move every time. It was amazing to see how many of them defaulted to the same predictable tactics again and again. They had a certain way of playing and a certain threshold for risk that didn’t vary from hand to hand. When it worked, they’d take pride in their skills. When it didn’t, they could say that it was bad luck or the cards were running against them. How many times have you seen that in business? When times are good, many leaders believe the company’s success is all about the smartness of their moves. When times are bad, it’s the market’s fault. No matter what, they stick with a way of doing business that doesn’t adapt to shifts in the game. They do the right thing for too long. Once you’ve figured out their pattern, you can predict how they’ll play the game and how to beat them. So how do you figure out the pattern? You study the strategy of your competitors and everything that’s likely to affect it. I believe in studying my competitors: how they think, their childhood, what’s important to them, where they’ve had successes and made mistakes, how they’ve approached the market, and—perhaps most important—how they want to be viewed by their customers, their employees, their shareholders, and even their government. One of the best examples comes from Huawei, which was a tough competitor from China when I was CEO of Cisco. Along with being a major brand in smartphones, Huawei was also a giant in networking equipment and other technologies that compete head-on with Cisco. A number of years ago, we caught them blatantly stealing our product code and made the difficult decision to hold them accountable. Very few American high-tech companies were willing to challenge a Chinese competitor about stealing their intellectual property. The odds of success seem too low and the risks seem too high. We made a decision to do it, but it wasn’t a single move. We planned for almost six months and had worked through all the possible implications—from how Huawei would react to the impact on our business in China—before filing a lawsuit in a Texas district court in early 2003. Even as we were filing that suit, we’d anticipated how we would ultimately settle the suit if we were successful. The process we used to plan our strategy might seem unorthodox but I’ve used it with great success in many situations since. Instead of handing the problem to our lawyers or the local team in China, I assigned a mix of people to two groups: a green team and a red team. The green team’s job was to show how we could win and the red team was assigned the task of pointing out the perils and weaknesses in our position while building arguments for the other side. We didn’t just look at the actual facts of the case. We looked at everything, from the family background of CEO Ren Zhengfei to China’s handling of unrelated but similar cases. I study my competitors closely because I want to understand their mindset and figure out how they think. What most of us do in competitive situations is assume that our competitors will do what we would do, rather than predict what they will do based on their background. The key is to focus on what the other player is likely to do, not on what you would do in their situation [SW1] . At Huawei, for example, I always knew that founder Ren Zhengfei would avoid any outcome that might cross the Chinese government. From that we concluded Huawei would agree to stop copying our intellectual property, if we could address it in a constructive way that would not embarrass the company or government. Every company has its own unique culture and approach to competition. At IBM, I knew that the strong cultural instincts of its leaders were to build a new capability rather than buy it, making them unlikely to compete with us on acquisitions or to make bold game-changing moves. Some competitors—Nortel and Lucent come to mind—had an aggressive take-it-or-leave-it attitude to customers while, for others, the customer is always right. If you study the kinds of deals that other companies do and constantly seek feedback from customers and people in the industry, you’ll learn how your competitors operate. You can do that with any rival, big or small. The more you understand about their motives and their style of play, the better you’ll be able to plan and outmaneuver them when you compete. Understanding the cultural and strategic differences of your competitors, customers, peers, and partners is critical to success. I think we sometimes focus so much on the differences that we fail to see the areas where our interests and instincts overlap. On the surface, countries like France and India don’t seem to have much in common. Their cuisine and cultures are profoundly different. France is a mature economy that’s dealing with an older population, while India is an emerging economy with a young population. What they share are visionary leaders who are excited by the potential of digitization and committed to turning their countries into startup nations through bold, inclusive, and inspiring strategies. I was deeply honored when President Macron of France appointed me to be the first global ambassador of French Tech, because of our shared commitment to entrepreneurship, innovation, and startups in his country. I was even more excited when he invited me to join him on a state visit to India to meet with Prime Minister Modi’s government and Indian business leaders. President Macron knew how much I admired and supported Prime Minister Modi’s vision in India despite, and in fact because of, the risks and courage that it involved. On the flight back to France, a member of Macron’s team shared a story with me about how Napoleon selected his top generals. He would look for signs of courage and calm under fire, but what he really focused in on was how lucky they had been. The reason: Lucky generals, in Napoleon’s opinion, tend to win wars. People who believe that they’re lucky tend to be optimists, outline bold goals, prepare for the opportunities and the challenges, and know exactly what they want to achieve. As a result, they tend to be lucky again and again. They don’t get bogged down in worrying about all the things that might happen today because they’ve already played out the entire battle in their minds with all the potential moves along the way. Because they visualize and prepare for a positive outcome, and they usually achieve it. That kind of mindset makes you agile. When you plan around an outcome, you can adapt your behavior when new factors arise. If you don’t change your approach to accommodate different teams or conditions, you simply won’t win as the world changes. One of the most meaningful compliments I ever got came from a competitor of mine who’d occasionally been very tough on me publicly. After a session at the World Economic Forum annual meeting, he came up and said, “John, I want to congratulate you on how you’ve reinvented yourself and your company.” His comment caught me by surprise, but I thanked him and said it was a good skill to learn, which is why I believe a CEO has to be in a job for more than four or five years. He immediately disagreed and confided something to me that I’ve never forgotten. “I am usually in a CEO role for three or four years,” he said. “I use my bag of skills to get results and then I move on to the next place to do the same thing in another situation. I don’t reinvent myself. That’s why I have to move on and look for new situations where my skills can be used.” He could see that I didn’t buy it, so he tried another tack and asked, “Out of your top 100 leaders at Cisco, how many have you left in the same role for more than four or five years—and been satisfied with their performance in later years?” He got me there. I could think of only one: Joe Pinto, who ran customer technical support at Cisco for more than two decades. In every other role, I had world-class leaders but all of them had strengths that were best suited to a particular time and stage in Cisco’s life. After several years, many wanted to move on to a new challenge, a new role, or a new chapter in their lives. Often, we needed someone else in their role with a different set of skills because the environment had changed. Whether it’s chess, bridge, or duck hunting, how you win is the same: you look for the pattern of behavior from your challenges, anticipate all the different scenarios of what could happen, and plan your moves in response to what’s happening in real time. The more confident you are about how things will play out, the more ambitious your bets can be. Every major success we had at Cisco was a result of something we’d started three to five years earlier. We made a bet on where the tech world was going and knew we wanted to be ahead of those transitions. Once we could see how we could get there, we communicated that vision to the market, customers, employees, partners, and everyone else. That’s when you create excitement around the opportunity and a healthy paranoia around the risks. We didn’t win every time, but having played out various moves in advance of the final result, we were able to respond more quickly when conditions changed. Sometimes, minimizing the damage of failure can be as important as achieving success. 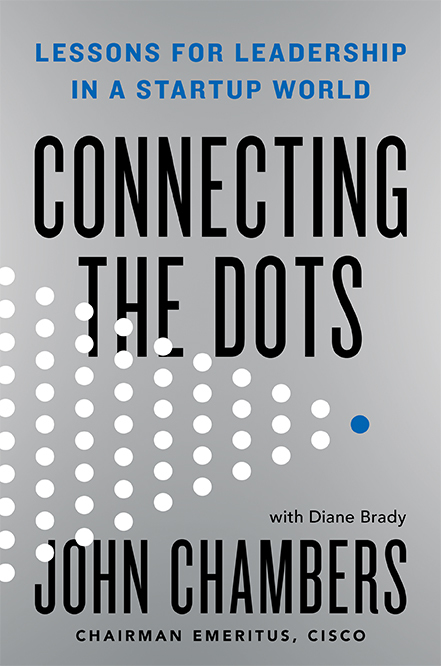 Excerpted from the book Connecting the Dots: Lessons for Leadership in a Startup World by John Chambers, to be published on September 25, 2018 by Hachette Books, a division of Hachette Book Group. Copyright 2018 John Chambers.